Jammu: Seventeen government employees, including three doctors, have been suspended after they were found absent from duty without official approval in Ramban district of Jammu and Kashmir, an official said today. Additional District Development Commissioner Ravinder Sadhu ordered the suspension, the official spokesman said. 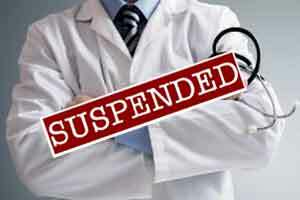 Eleven health department employees, including three doctors, posted at public health centres in Khari and Banihal sub-district hospital were among those suspended, he said. An executive engineer in Banihal, a government school teacher and an employee of the animal husbandry department were also among the suspended employees, the spokesman said. He said the commissioner ordered authorities to withhold the salaries of the suspended employees and conduct an enquiry. He also asked them to submit their report within a week.